Andrew Carnegie told us, "anything the mind of man can see believe, he can achieve". True optimism and confidence is the belief in yourself. When you believe in yourself, all things are possible and the person who possesses such belief will sincerely put forth the effort to accomplish that which he desires. 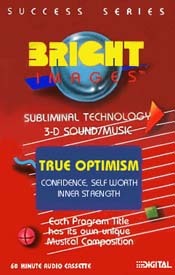 This program is designed to create concepts, ideas and images of confidence in your inner drive so that optimism and enthusiasm will be yours. This faith in you generates an inner drive so that optimism and enthusiasm will be yours. With confidence, belief in yourself, a strong positive attitude and good self-image, you can accomplish whatever you choose. The affirmations pertain to self-esteem, goal setting optimism, inner drive and enthusiasm in addition to self-confidence. The confidence messages contain concepts such as ability, belief, unexpected situations and being a winner.